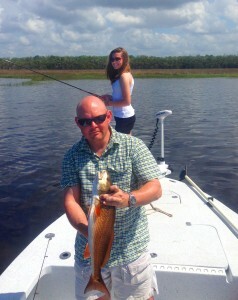 Our big concern has been the torrents of recent rain and the clarity of the water in the Big Bend. So far, things have been reasonable, but dark water was found several miles both north and south of the river. This creek and river run-off brings tannins from the flooded land into the gulf. While not affecting offshore fishing at all, it means that the water salinity is less in those dark water areas. While redfish are not bothered by low salinity, sea trout are. We’ve had lots of great trout catches this month, but many of them have come some distance from the river, with the Pepperfish Keys being the hot spot this month. Good catches also came from the Rocky Creek area and even as close as Hardy Point to the south. 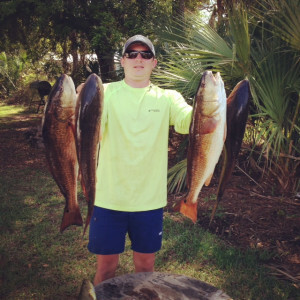 Some excellent redfish were taken this month; the two winning redfish in the Elite Redfish Tournament held at the Sea Hag weight just under 14 pounds. 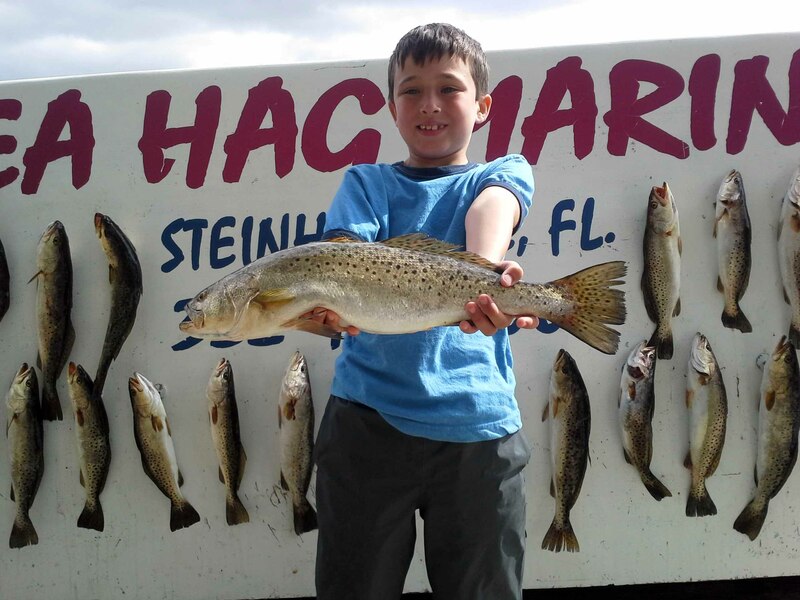 Most of the larger fish were taken from schools but there were also solitary fish caught around Big Grass Island and south of Rocky Creek to Sink Creek. 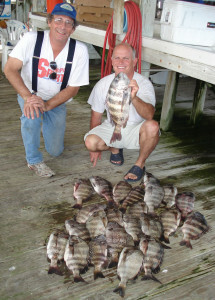 Offshore the weather kept down the number of long trips but the sheepshead bite kept people busy throughout the month. 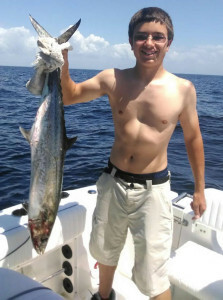 Spanish mackerel have been around (I’ve lost several top-dollar plugs within fifty feet of the shoreline) but good numbers of kingfish have been scarce. However, amberjack have been plentiful and providing lots of offshore action, and although gag grouper are closed in federal waters, they are open in state waters and a number of keepers were taken within 9 miles of the shore, including at Steinhatchee Reef. 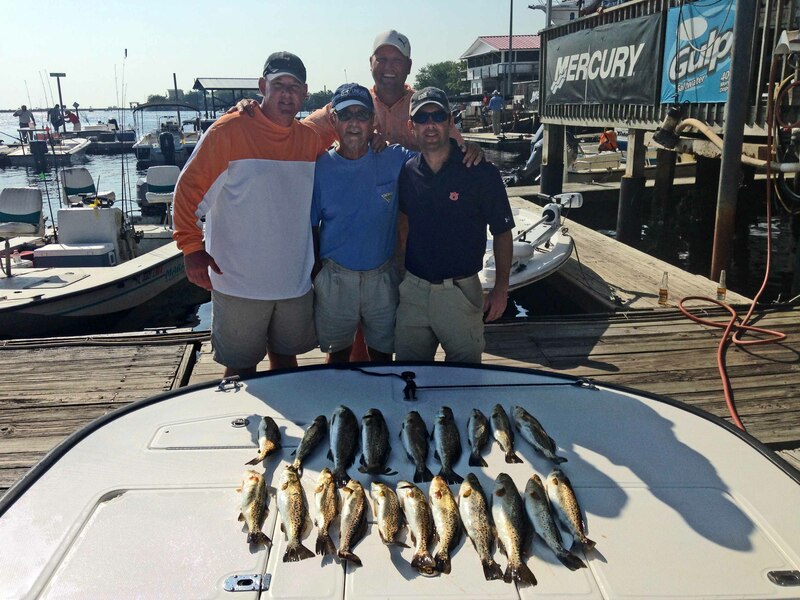 Here are some examples of the fine catches this month. Rick2 Jonathan Harrington and his daughter Abby fished with me and found some excellent trout and reds. 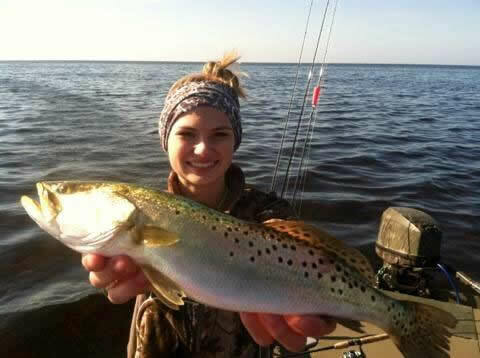 Abby Harrington with a keeper trout! 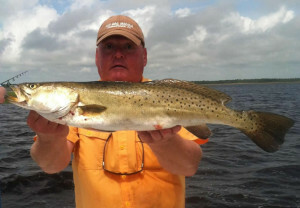 Troutmaster Max Leatherwood snared this great gator trout fishing a Gulp bait. Ray Mitchell with a fine sheepshead caught at Steinhatchee Reef. Eli Curl landed this 36 inch kingfish fishing out of Keaton Beach. Sister Chaeli Norwood with an excellent trout taken on the same trip. Capt. Nita Chester and twin sister Marie Griffies with a fine flounder/trout duo. 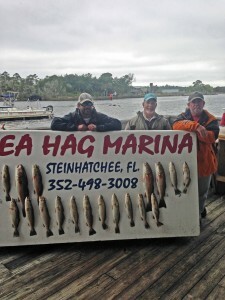 Matt Mitchell and brother Brian from Valdosta found these excellent keeper redfish fishing out of the Sea Hag Marina at Keaton Beach. Ray Malloy and Eston Crowder with several sheepshead limits. 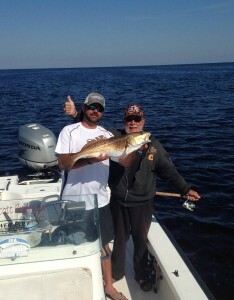 Skippy Sims and Woodrow Shaw from Atlanta had a great few days fishing in Keaton Beach in shallow water with Gulp baits. Alexander Tanner from Woodstock, Ga. caught this nice Spanish mackerel out of Keaton Beach. 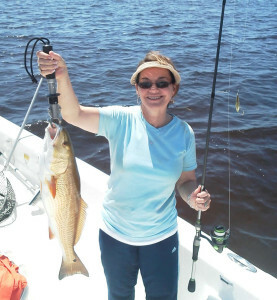 Trish Leary with a fine redfish caught on the traditional bait…..a gold spoon. 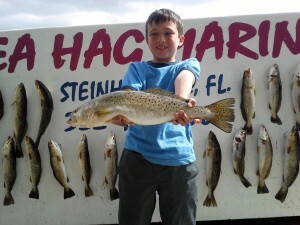 Tommy Ballard with a 27 inch trout caught on a Sea Hag live shrimp. Taylor Thomas from Hahira, Ga. was fishing with her mom and dad and came upon this giant Spanish mackerel. Anna Patterson boated this gag grouper at the Steinhatchee Reef. 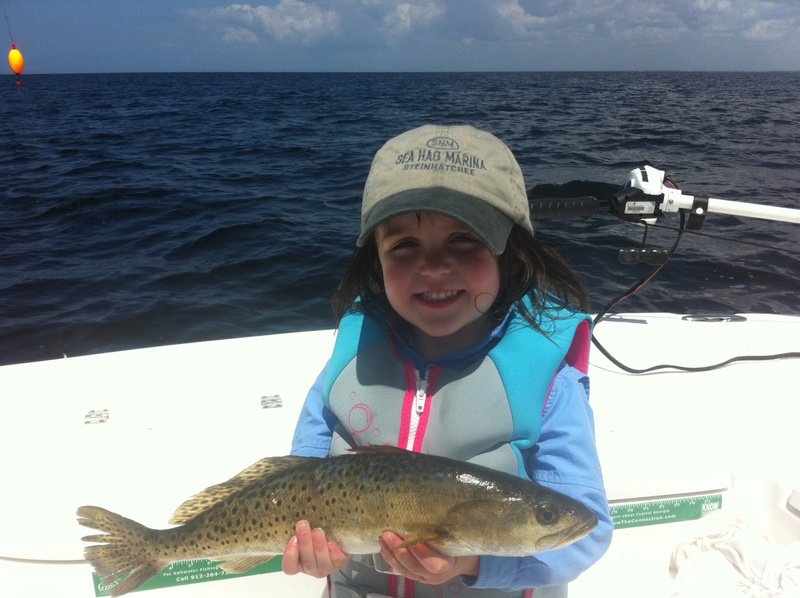 Ellie Chupp from Eatonton, Ga. caught this nice trout fishing with a live shrimp. 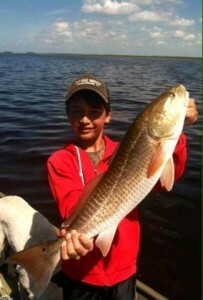 J. Riley from Butler, Ga. caught his very first redfish fishing out of Keaton Beach. Everyone’s fingers are crossed that the rains will cease and allow things to dry out a bit as scallop season approaches. Regardless of the rain, attention will shift to nearshore fishing as more and more whitebait will arrive in the area, bringing more Spanish mackerel, cobia and kingfish to our area. In fact, a number of cobia were caught on the flats during the last week of April, and that action will only improve. 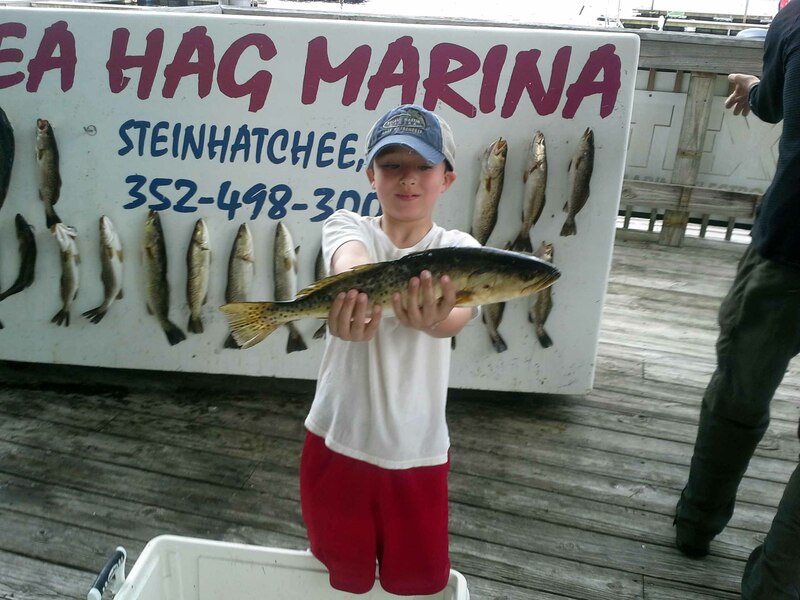 Look for schools of bait near the nearshore bars outside of Bull Cove, and in the well-known areas of 9 Mile Bank and Little Bank to the north. We also may see some migrating tarpon moving across the nearshore sand bars. Seagrass is filling in nicely and more and more pinfish are moving in closer to shore, which will bring even more large trout onto the three foot flats, especially over spotty areas with mixed sand and grass. 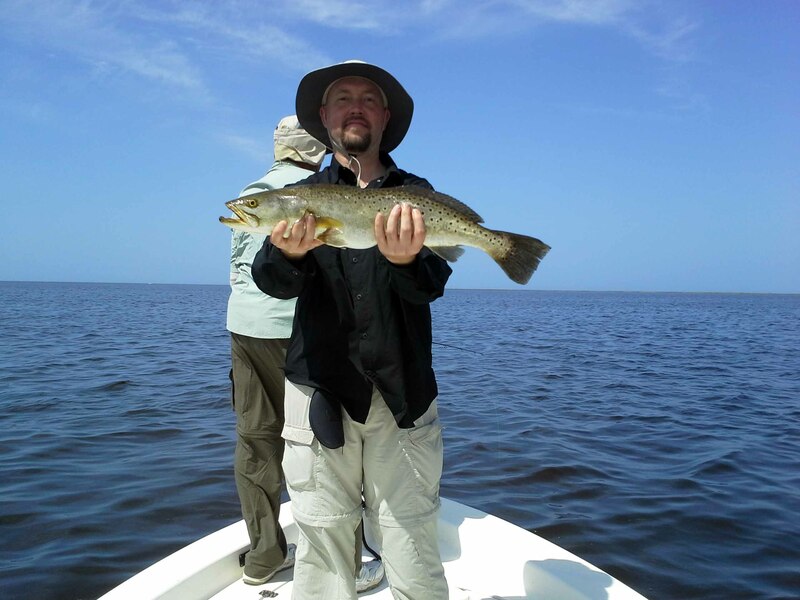 Fishing popping corks with live shrimp or artificial shrimp such as Gulp or DOA baits will provide lots of action. Redfish will continue to be found as solitary fish around structure in shallow water and in schools in slightly deeper water. The big Taylor County Optimist Tournament will be held at the Sea Hag Marina on May 3, with weigh-ins also possible at Keaton Beach and Econfina. 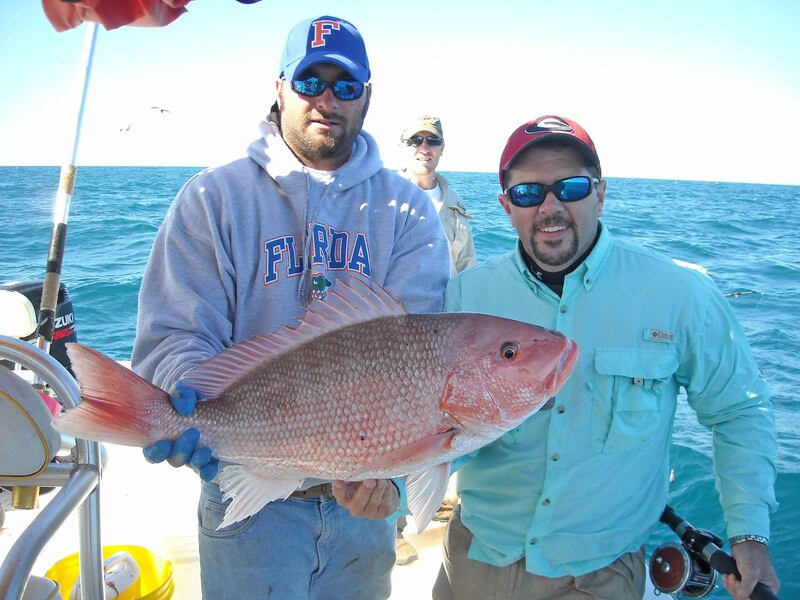 As expected April was a great month to be on the flats. 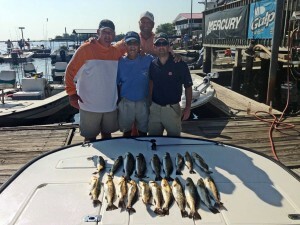 Plenty of trout to be caught, and we caught them. Proud to report that on one charter a trout of 31 inches was caught and released after a photo op. 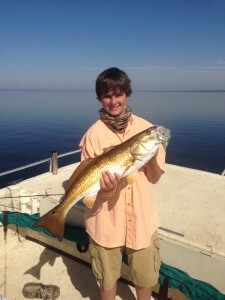 Stephen from Savannah not only caught that one but also a 28 incher. The Coleman party released 6 over 20 that day. The reds are schooled up when you find them. 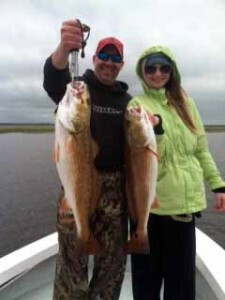 Still a lot over the size limit cruising the shallows. 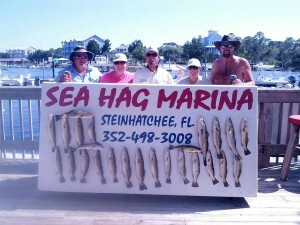 Lots of Spanish shallow and deep, especially around bait pods. The pinfish are finally adapting to all the fresh water out there and the trout are eating them up. 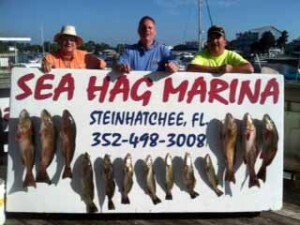 Sea hag has pinfish for sale as well as boats for rent if you wish to save a few dollars over the price of a guide. 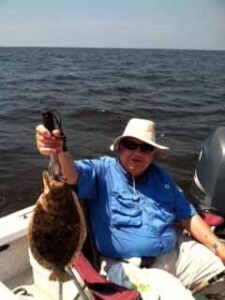 Just remember that the guides know where the fish are. Sorry I do not have any days open in May but still have a few open in June. June is also a great month to fish the flats. I am also taking reservations for scallop season. 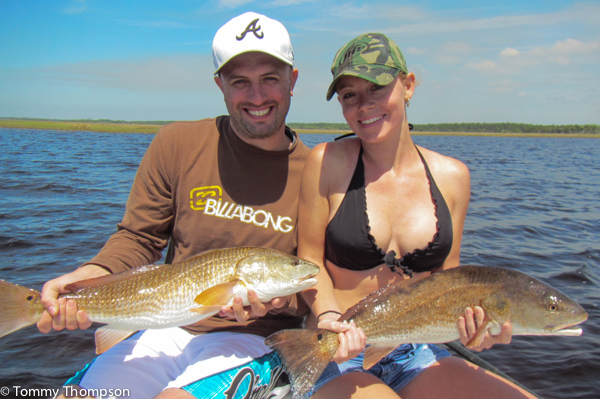 Why not book a scallop and fishing combo? 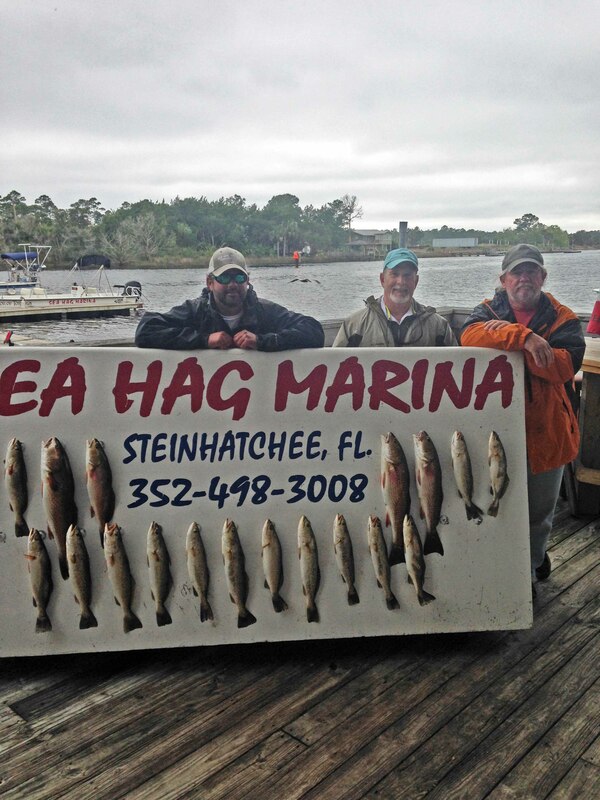 A FAQ to me is, “When is the best time to come fishing in Steinhatchee?” The word May is always in the answer. 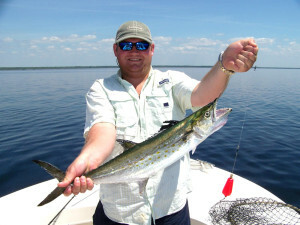 May is a piscatorial party time with the blend of local reef fish with a mass influx of party favor baitfish and big pelagic party followers. 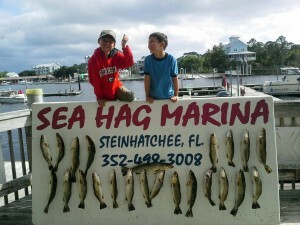 May is awesome for anglers in and around Steinhatchee! 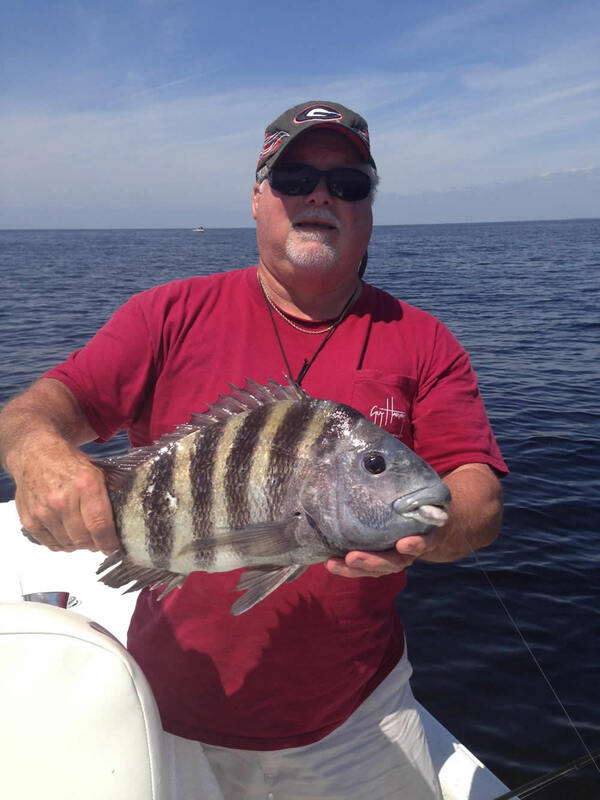 The party starts with the party favors when the two punch twosome pinfish and pigfish return to the grass flats and a mix of blue runners, cigar minnows, Spanish sardines and cruising cousins cover the offshore waters. Local reef fish get happy (hungry) and aggressive when the pelagic party crashers blow in. 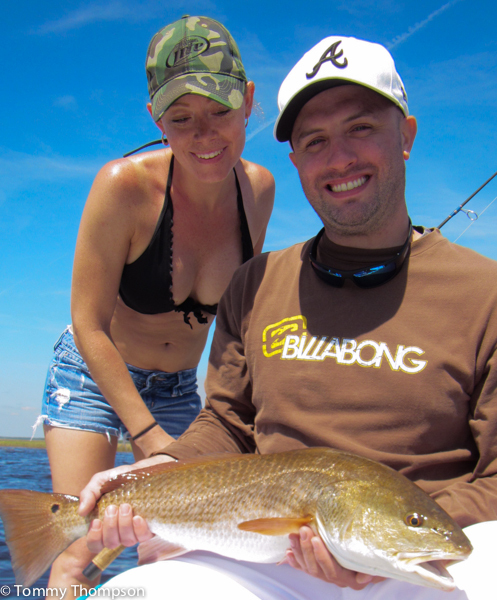 Redfish and trout take full advantage of the influx of pin and pigfish coming in from offshore, as well as the pelagic baits running over the grass flats. 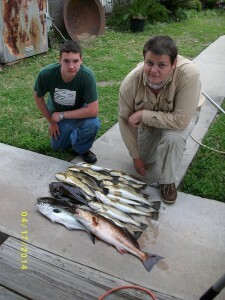 Furthermore, cobia are first spotted and caught by inshore angles as these fish migrate along the coast from the south. 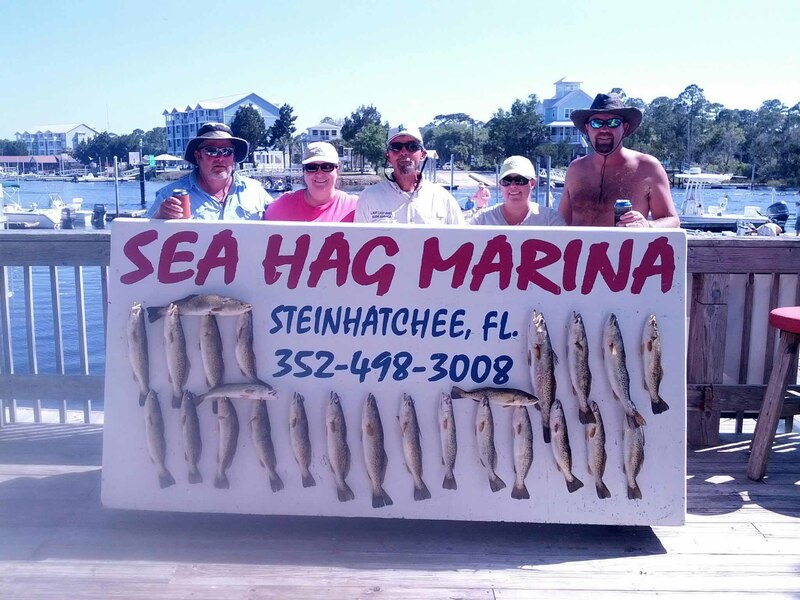 The Mosh Pits are the bait pods just off the grass flats, 4-8 miles offshore, that are being crashed by ladyfish, Spanish mackerel, kingfish and others. Casting jigs, spoons, and flashy plugs into the mêlée is fish action squared. The clue is watching for the diving birds, which are action tattle-tales. You can make a ‘memory day’ just chasing pressed bait pods. Now, usually, the first of the morning and the latter evening are when fishing the bait pods is most effective. The fishing is sea dependent. If the seas are calm to slick, bait pods are pushed to the surface and visible. 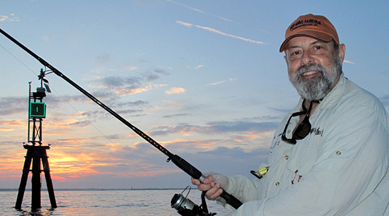 If the seas chop up, the bait pods will sound and working flashy artificial lures whether trolling or casting can still work. Or, try drifting live bait free-lined or under a cork. Any high relief bottom, natural or artificial, will hold a party congregation of pole bending, drag screaming, arm-aching amberjack. The best bait? 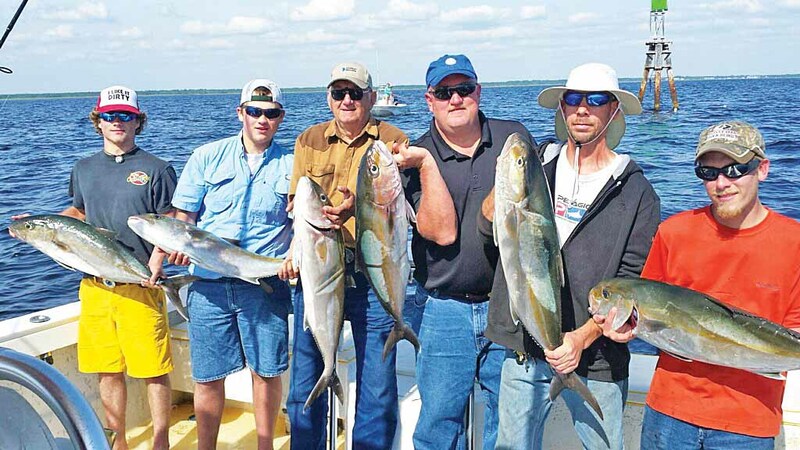 Free-lined live bait and the best are blue runners. Taking time to toss some flash jigs over known sheepshead haunts to acquire a dozen or more blue runners is time well spent. The drop-back live baits are, always, pin and pigfish. 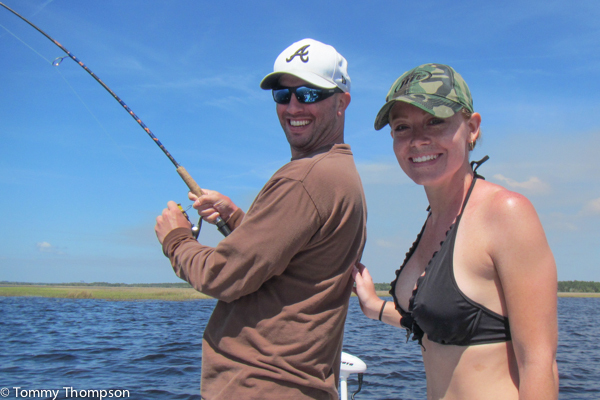 Keep in mind, fresh and frisky is best or resort to 1-4 oz colorful jigs and work them fast and haphazardly. 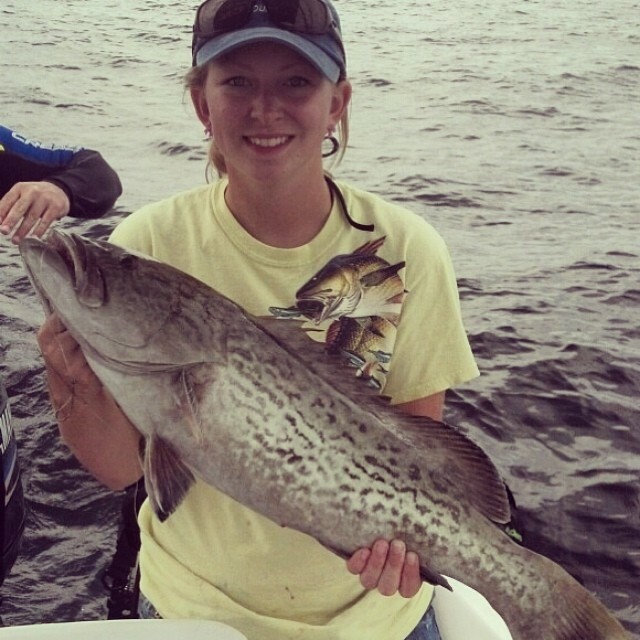 In May, the feds have gag grouper closed in federal water. 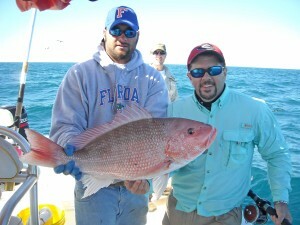 so red grouper are the main target. 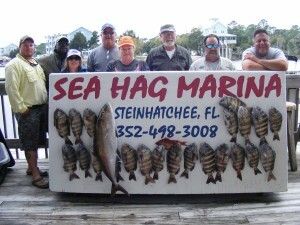 Expect to toss back many, almost extinct gag grouper while targeting red grouper. 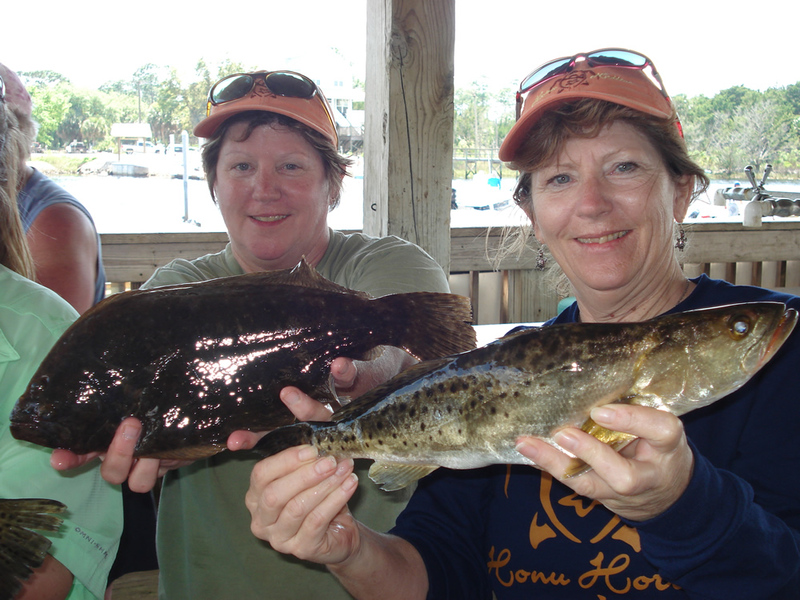 The best grouper bait is live, but to cull toward catching more red grouper use fresh cut-bait. 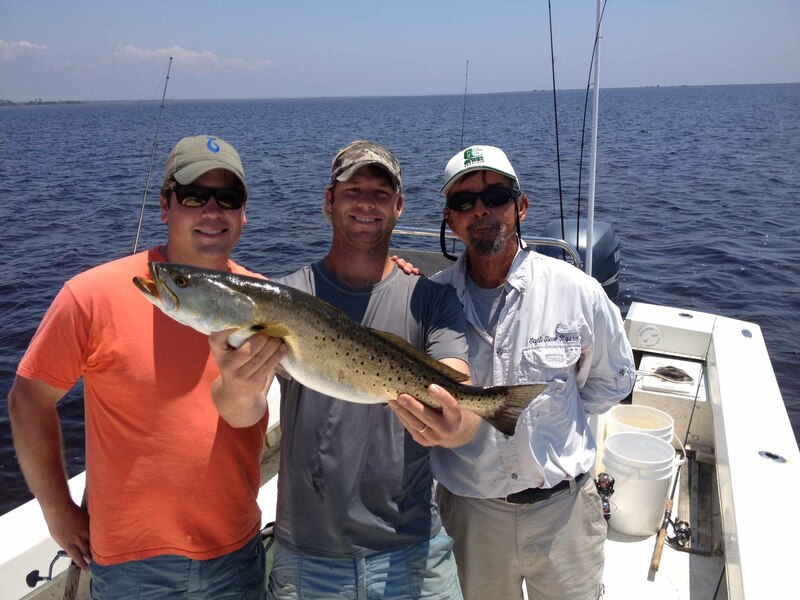 Anyway, May is one of the best times to come and fish Steinhatchee so make plans to do so. It is that time of year again, the time of year that most inshore species are at the peak of their game and fishing on the nature coast is about as good as it gets .We have been very successful fishing for reds in 2-4 feet of water with rocky bottom. 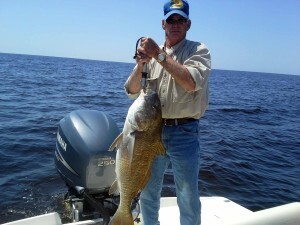 Limits of redfish are not uncommon; however we have been catching more oversized reds than slot fish, which is a good problem to have. Nothing like wrestling a 30 inch red on a 3000 Shimano!!! Shallow diving plugs are offering good results as are a variety of Gulp baits. 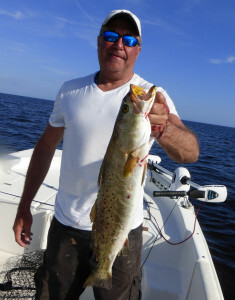 Let’s not overlook the trout bite; they are plentiful as well and it is not uncommon to limit on both reds and trout with an early to mid day high tide!!! 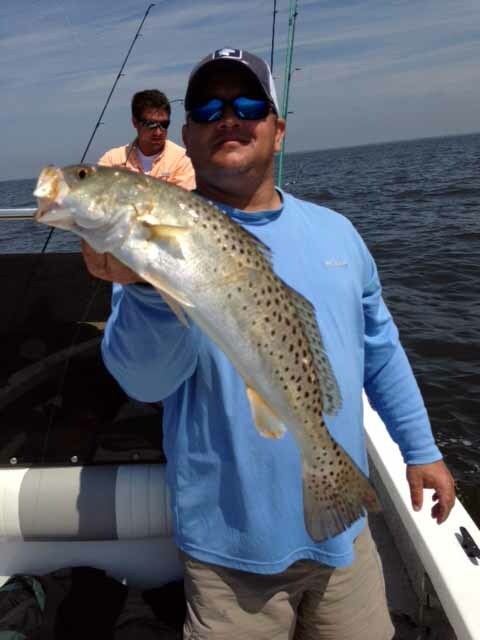 Fishing has been very good lots of bait showing up on the flats and trout are willing to bite and it will only get better as we jump into May. 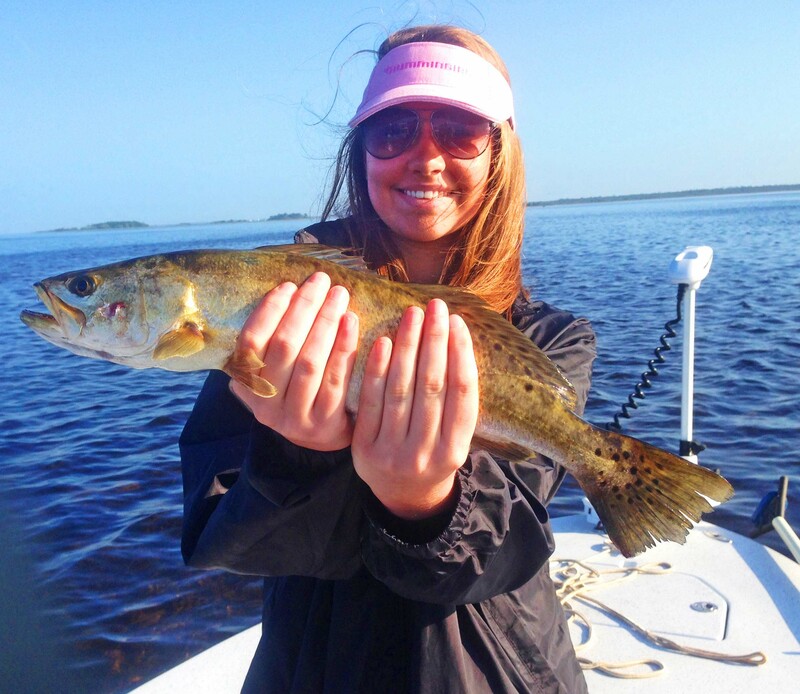 This time of year you can catch trout on the breaks or in the shallows and they will hit Gulps and cut bait or shrimp if you prefer. 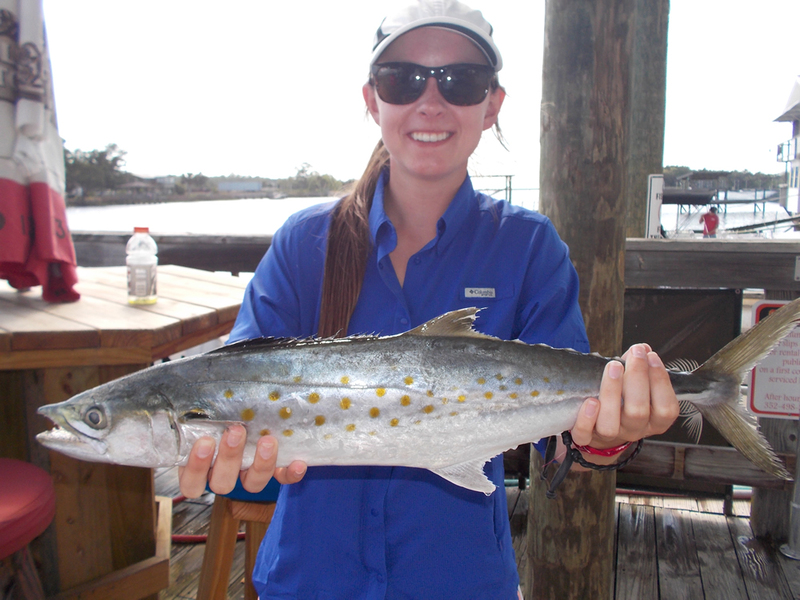 Spanish mackerel are moving in following the bait pods; anywhere you see bait activity there will be a multitude of species underneath them trying to satisfy their appetite. Of course you will have to weed through the annoying lady fish to get to your intended fish of choice. 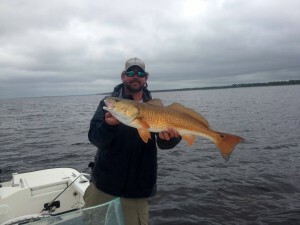 The redfish bite is good if you can get a day without a tournament taking place as this stirs them up quite a bit and makes it a little harder to locate them. Hopefully May will bring us some stable weather conditions in which to pursue your intended quarry as April was a bit unsettled but it was still possible to fish around these fronts and catch plenty of fish with some patience. 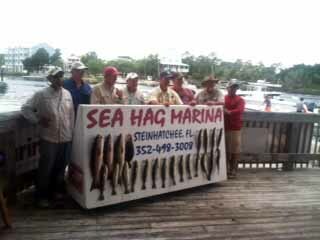 Best of luck to you and remember to be considerate of other fisherman and be safe out there.